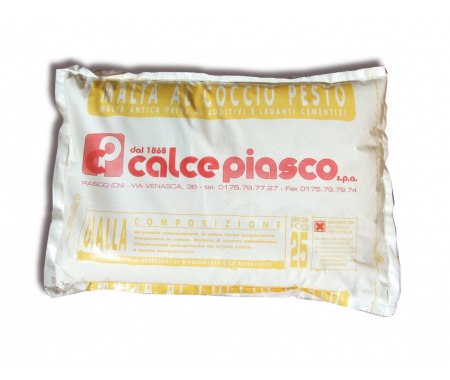 > Natural hydraulic lime plaster>Plaster In Lime and Cocciopesto Yellow ivory - Bag Of 25 Kg. 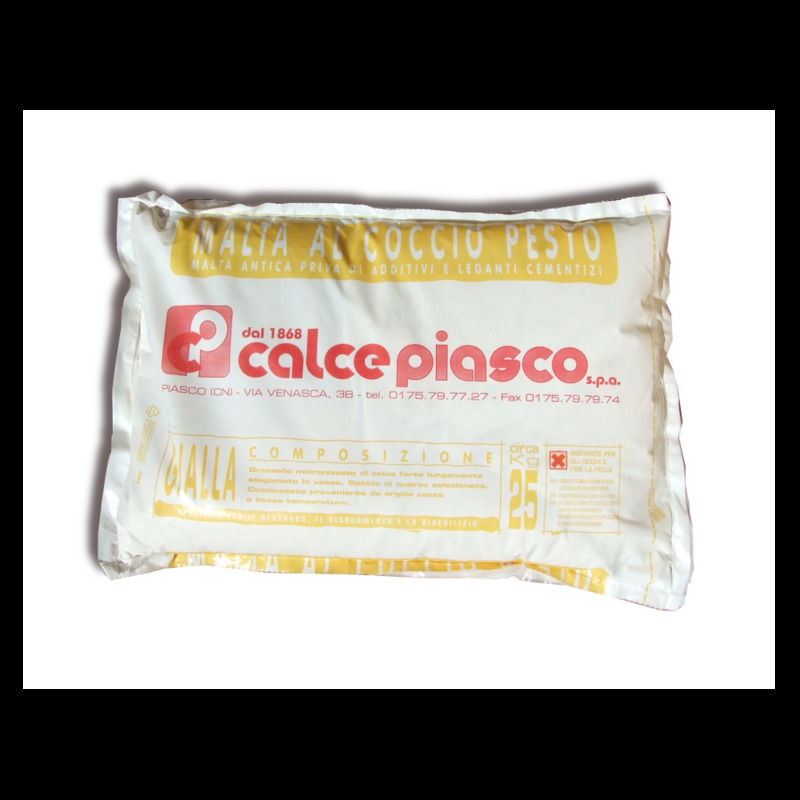 Plaster In Lime and Cocciopesto Yellow ivory - Bag Of 25 Kg. The silica in the low temperatures cooked clay binds with lime, creating calcium silicates that increase the mechanical resistance of the plaster. The lime and cocciopesto plaster is a genuine product composed only of natural components. 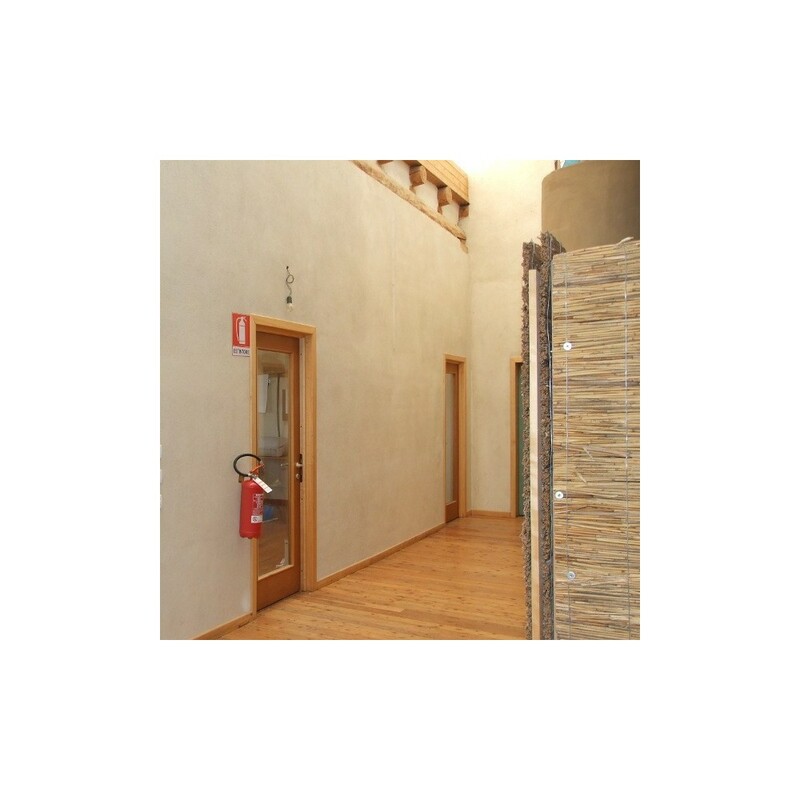 Lime and cocciopesto plaster is suitable for interiors and exteriors, giving healthiness to environments by the transpiring macroporous structure. The lime and cocciopesto plaster has a good elasticity and sticks perfectly onto the supports. It is a pre-dosed damp mortar composed of slaked strong natural seasoned lime, selected sand and cocciopesto powder obtained by cooking and grinding cooked clay at low temperatures, between 900 and 1000° C, all contained in different bag's compartments. Mixing the components of the three compartments starts the natural chemical hardening process of the mixture, the lime mortar also hardens thanks to the absorption of the carbon dioxide present in the air, starting the process of lime reconstitution. The good adherence to the supports and the slow grip reduces the danger of cracking. Excellent for interior and exterior plasters. 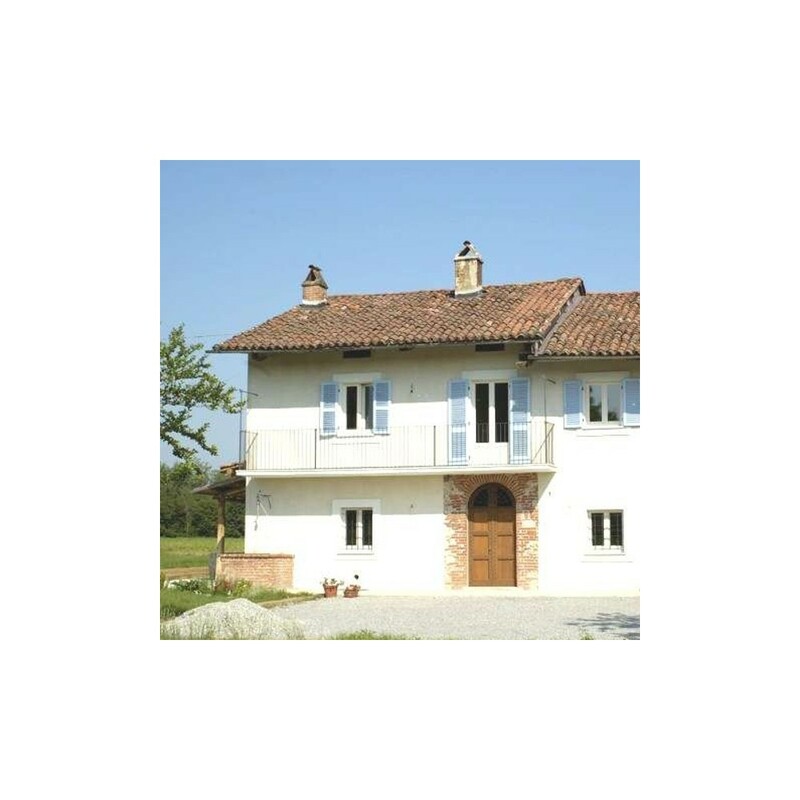 The lime mortar and cocciopesto mixed with water can be applied by hand or machine, the natural color makes the plaster aesthetically pleasing without appling additional finishes or paints. The excellent vapor permeability also offers a good dehumidifying function. The genuineness and simplicity of the recipe makes this mortar-plaster suitable for the old walls as the realization of new plasters. 18 months in closed package, even outdoors. 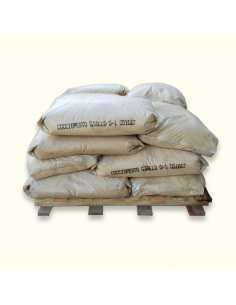 Pour all the contents of the bag in a horizontal-axis mixer or in a cement mixer adding the necessary water. For manual mixing it is advisable to put in the bucket first 1-2 liters of water, the contents of the bag and only at the end the water necessary to reach the desired consistency. The plaster is applicable by hand or machine. The old heterogeneous or irregular supports must first be regularized using the same plaster. The walls must be stable, clean and moistened before application. We recommend a maximum thickness of 2 cm per shot. On damp walls it is advisable to apply shims of at least 3-4 cm since a good thickness of macroporous plaster will confer greater ability to dispose of humidity of the wall. It must also be avoided to cover the lime and cocciopesto plaster with synthetic waterproofing paints or coatings as they would prevent the lime reclamation process. 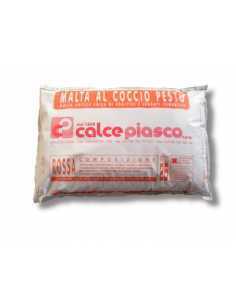 Consumption per centimeter of thickness: 17.8 Kg Of cocciopesto mortar per sq.m. With 10 ql of mortar, 56 sq.m. of cocciopesto plaster is made. Considering an average thickness of 1.5 cm, it takes about 1 bag per square meter. - Spatula: with smooth spatula passage of a second fresh layer on fresh. - Civil: with subsequent application of lime plaster with medium granulometry. Respecting certain conditions, the cocciopesto lime plaster can also be used as a finishing layer with a minimum thickness of 5 / 7mm. Apply as a finish only on absorbent and sufficiently rough surface like lime-cement mortar, if it is not too smooth. To prove the absorption capacity of the substrate, wet the surface and observe the degree of absorption: if the surface remains easily wet it means that the plaster can be applied, if the water slips away or not wet the wall it's necessary to remove the impermeable layer before applying the lime plaster. However, it is good to carry out a test before proceeding with the whole process. With 10 quintals of mortar, about 100 square meters of cocciopesto plaster are made.